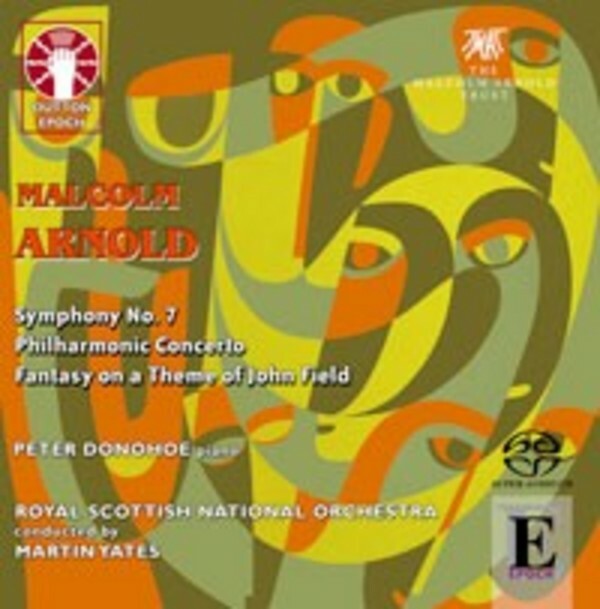 With three major works by Malcolm Arnold from the mid-1970s, Dutton Epoch surveys his music written in Ireland. The focus of the programme is Arnold�s Seventh Symphony, dissonant and exhilarating by turns in the first movement and ending with Irish elements crowned by a riotous Irish reel complete with the pounding rhythm of a marching drum. The distinctive sound of a cowbell in the outer movements characterises the music in memory. Peter Donohoe is the commanding pianist in the Fantasy on a theme of John Field op.116. Arnold called it �a piano concerto in one movement� in a piece in which John Field�s radiant seventh Nocturne for piano is subjected to a variety of treatments from wild march and circus music to lush romantic panoply. The London Philharmonic Orchestra commissioned the vigorous display piece, the Philharmonic Concerto op.120, for an American tour. It is in fact a sort of Concerto for Orchestra � and the RSNO rise to its colourful demands with typical verve. The composer promised it would offer �the glorious sound of a symphony orchestra�, and it certainly does with the RSNO�s brilliant playing.